Apacer knows it best when it comes to speed and uncompromised gaming performance. Z280, the latest answer to advanced SSDs, supports PCIe Gen 3 x4 and is compliant with NVMe 1.2 in a M.2 form factor. The blazing speed will boost the game status without getting too costly. With sustained read/write performance at 2500MB/s and 1350MB/s, the compact M.2-2280 keeps everything efficient at a massive capacity of 480GB. Want to be one step ahead of others? Look no further than Z280, the high-performing SSD that is compatible with mini PCs and laptops. Built with upscale SSD technologies that Apacer is synonymous for and excellent quality MLC, the cutting-edge Z280 is compliant with NVMe 1.2 standard and features the latest PCIe Gen 3 x4 interface to provide up to 4 times of bandwidth. The expert team at Apacer raised the bar of the industry by creating a blistering transmission at 2500/MB & 1350MB per second. Offering a massive memory capacity of 480GB, Z280 has a random write of 175,000 IOPs to ensure all actions in each gaming scene is smoothly processed, fluid and sharp, efficiently boosting a gamer’s status. With only 80mm in length, Apacer Z280 adopts the ultra slim size of M.2-2280 and fits most of the laptops and mini PCs, easily turning any devices into highly portable gaming tools. With utmost performances and superb qualities, Z280 is undoubtedly the most powerful booster you can find for gameplay enhancement. 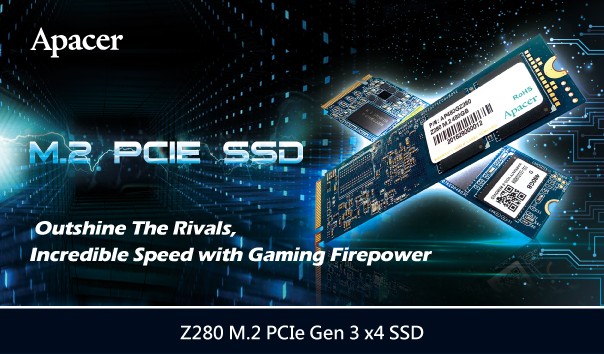 Z280 is equipped with several advanced features to ensure PCIe Gen 3 x4 performs at optimum, including ECC with 120bit/2KB BCH, End-to-End Data Protection, Smart ECC™, Global Wear Leveling, for fortified SSD life, SmartRefresh, for maintaining accuracy and safety of data access, and S.M.A.R.T. monitoring system to keep all performances at their smoothest. Meanwhile, Apacer publishes specially designed Apacer SSDWidget software which allows users to examine the SSD status as well as instant firmware update. In addition to all the phenomenal features, Apacer Z280 is an efficient power saver, capable of performing at low-power consumption, enabling to the laptop battery to sustain longer and PCs to be eco-friendlier.